Does Jack Evans’ Parking Really Matter? 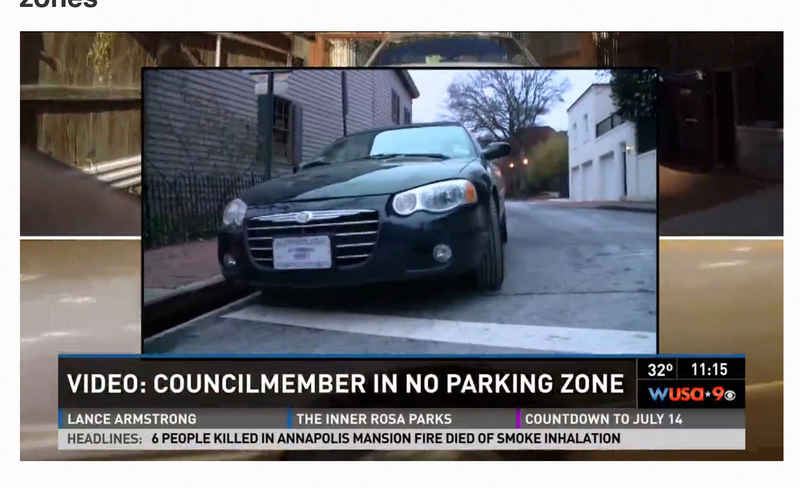 Last week, the local CBS news ran an expose on something all Georgetowners already knew: Jack Evans takes advantage of his parking privileges as Councilmember to park illegally a block away from his house without getting a ticket. It’s a subject GM himself looked into six years ago. But the real question isn’t whether Evans abuses his parking privileges, the question is does it matter? Don’t get GM wrong, he hates seeing elected officials abuse their power. And nobody gets quite as indignant about their right to abuse that power as Evans and his parking. Last time GM wrote about this, he got an angry missive from Evans’ office. And when CBS’ Russ Ptacek confronted Evans, he essentially blew him off. As someone who gets around primarily by foot or bike, GM can say with certainty that he would far, far prefer the city spend its enforcement resources focusing on the literally tens of thousands of people who drive around every day with the inflated sense of entitlement and impatience that Evans and (some of) his elected colleagues park with. Once our streets are safer from the masses of dangerous drivers, maybe then we can focus on 13 officials.